(CNSNews.com) - The Labor Department's Bureau of Labor Statistics shows an improving/mixed employment situation in September, in the numbers released Friday. 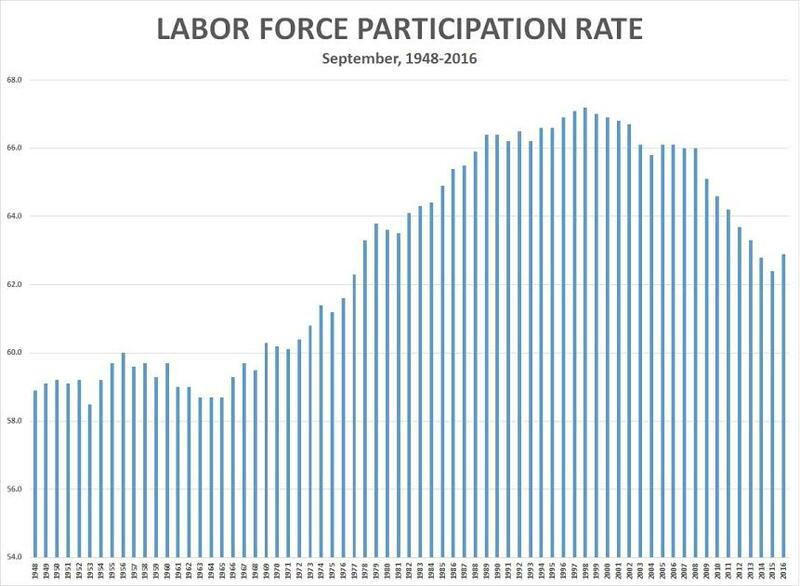 94,184,000 Americans were not in the labor force in September, 207,000 fewer than in August, and the nation's labor force participation rate, which began its steady downward trend in 2000, showed little change last month, rising a tenth of a point to 62.9 percent compared with August. At a recent news conference, Federal Reserve Chair Janet Yellen said the labor force participation rate has increased on balance since late last year, which "shows a substantial number of people are being attracted into the labor market." Yellen told Congress on Sept. 28 that the Federal Reserve expects labor market conditions to continue strengthening, making an interest hike likely soon, probably in December. In an August 2016 update to the nation's budget and economic outlook, the Congressional Budget Office said the "prevailing decline" in the labor force participation rate "reflects underlying demographic trends and, to a smaller degree, federal policies." The CBO said factors contributing to the decline in labor force participation include the continued retirement of baby boomers, reduced participation by less-skilled workers, and the lingering effects of the recession and weak recovery. "In addition," the report said, "certain aspects of federal laws, including provisions of the Affordable Care Act and the structure of the tax code, will reduce participation in the labor force by reducing people’s incentive to work or seek work." The labor force participation rate is the percentage of people in the civilian noninstitutionalized population, age 16 or older, who are either working or actively seeking work. People who are no longer looking for work, for whatever reason -- retirement, school, family, or they've just given up -- are not participating in the labor force. In Friday’s report, BLS said the economy added 156,000 jobs in September, below analysts' expectations of about 175,000. So far this year, job growth has averaged 178,000 per month, compared with an average of 229,000 per month in 2015. In September, employment gains occurred in professional and business services and in health care. The September unemployment rate increased a tenth of a point to 5.0 percent, as the number of unemployed persons increased 90,000 to 7,939,000 -- and the number of employed persons increased 354,000 to 151,968,000. Yellen told Congress last month that the participation rate is feeling "significant downward pressure" from the aging of the population, as more and more Baby Boomers retire and leave the labor force. "Aging of the population maybe one factor," Rep. Andy Barr (R-Ky.) told Yellen at the hearing of the House Financial Services Committee. "The other factor is that unemployment is coming down, not for a good reason, but for the wrong reason -- namely, that there's a frustrated workforce out there that's completely given up looking for work." In September, the nation’s civilian noninstitutionalized population, consisting of all people 16 or older who were not in the military or an institution, reached 254,091,000. Of those, 159,907,000 participated in the labor force by either holding a job or actively seeking one. The 159,907,000 who participated in the labor force equaled 62.9 percent of the 254,091,000 civilian noninstitutionalized population. Among the major worker groups, the unemployment rate for Hispanics increased to 6.4 percent in September, while the rates for adult men (4.7 percent), adult women (4.4 percent), teenagers (15.8 percent), Whites (4.4 percent), Blacks (8.3 percent), and Asians (3.9 percent) showed little or no change. The Labor Department will release its next jobs report on November 4 -- four days before the presidential election. Republican Donald Trump's job-creation plan calls for lower corporate taxes, reduced regulatory burdens on businesses, spurring American energy development, and negotiating trade deals that will bring manufacturing jobs back to the U.S.
Hillary Clinton's jobs plan includes "bold investments" in American infrastructure and "clean energy," including solar panels.